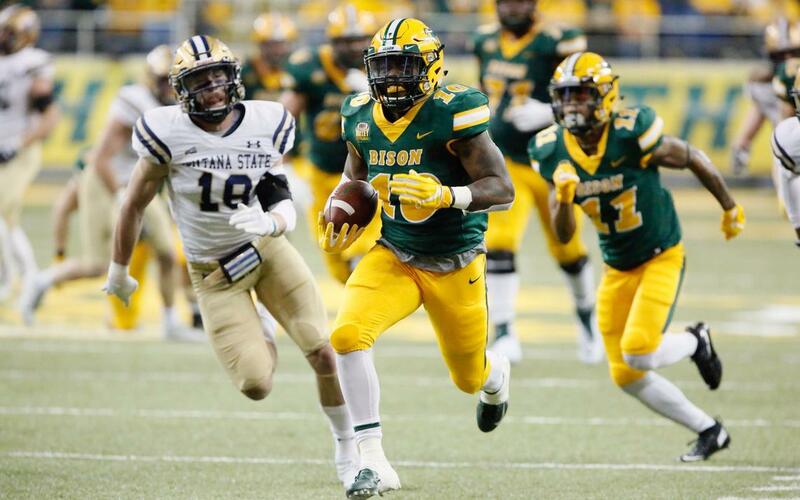 FARGO, N.D. —Lance Dunn scored four touchdowns all in the first half and top playoff seeded North Dakota State overwhelmed Montana State 52-10 in a second-round Division I FCS playoff game in front of 17,007 fans at at Gate City Bank Field at the Fargodome. MSU hit an explosive play on the first snap of the game, a 71-yard pass from Troy Andersen to Kevin Kassis, who dove for the pylon while being chased down the sideline but stepped out of bounds at the 4. The Bison stopped the Bobcats on their next three plays, and MSU settled for a 24-yard field goal by Tristan Bailey to take a 3-0 lead. From that point forward, the Bison took control. Lance Dunn scored the first of his four rushing touchdowns to open the onslaught. Dunn wound up scoring on runs of 46, 11 and 1 yard (twice) as the Bison took a 38-3 lead into halftime. Dunn’s touchdown total tied NDSU’s playoff record set by D.J. McNorton during a 2010 playoff victory over ironically also over Montana State. Montana State scored its first and only touchdown of the game in the third quarter when Troy Andersen broke free on a fourth-down carry. Andersen sprinted 51 yards to the end zone, scoring his 21st rushing touchdown of the season to set a new MSU single-season record. Don Hass had 20 rushing touchdowns in 1966. NDSU added two more rushing touchdowns to close out the win. Dunn finished the game with 127 yards on 11 carries, Bruce Anderson added 118 rushing yards and a touchdown, and Ty Brooks recorded 103 yards (on just six carries) and another rushing score. Andersen led the Bobcats offensively by passing for 124 yards and rushing for 129 yards. The Bobcats finished their season with an 8-5 record. “It was a great opportunity for our young men to see what the top echelon of FCS looks like,” Bobcats head coach Jeff Choate said. The NDSU (12-0) win sends the Bison into the quarterfinal round, where it will host eighth-seeded Colgate (10-1) next week. Colgate defeated James Madison 23-20 in a second-round game on Saturday on a game-winning field goal.